A man was killed after his motorcycle accidentally slammed straight into an incoming minibus along a national road in Sagbyan on Thursday morning. 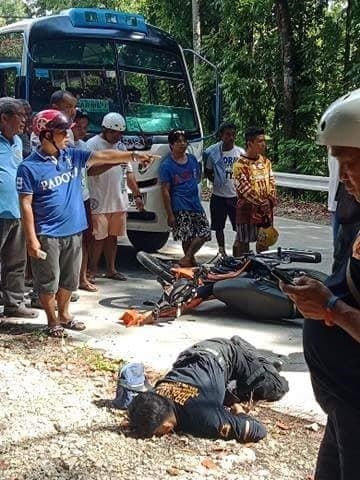 Police Officer 3 Anthony Vistal of the Sagbayan police identified the fatality as Diosdado Maestrado, Jr., 65, a resident of Barangay Villa Arcayo, Carmen and a member of the Bantay Bayan Bohol Province Crime Watch. The ill-fated motorcycle then collided head on against the minibus of Anilus Lines. According to the bus’s driver, Vincent Pandan, he immediately stepped on the brake after noticing the out-of-control vehicle heading towards him. However, Maestrado still barreled towards the bus leading to the collision. Vistal said that Maestrado sustained injuries in his head. He was still rushed to a nearby hospital but was declared dead on arrival. According to Vistal, Maestrado had with him a helmet but did not wear it.